Francis Chan will address Voices Together on Canada Day. There is just one week now, until Christians from all over Metro Vancouver gather for Voices Together. As many as 12,000 people will worship and pray together at Pacific Coliseum on Canada Day (July 1), starting at 5 pm. Worship Central, involving people from many congregations, will lead worship, and there will be a mass choir representing churches involved in the Vancouver Chinese Evangelical Ministerial Fellowship. 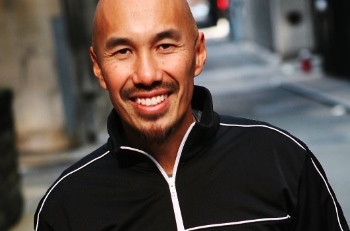 Well known author and speaker Francis Chan will address the gathering. Chan, a pastor in the San Francisco area, is probably best known for his bestselling book Crazy Love: Overwhelmed by a Relentless God. The event will conclude with a “next generation movement,” says Giulio Gabeli, chair of the Voices Together core group, which has representatives from a wide range of Protestant churches, and the Roman Catholic Church. An estimated 100 youth pastors and leaders from Metro Vancouver will come together on the stage at Voices Together. “There will be a time of highlighting the young, emerging leaders,” Gabeli says. Tickets are $15 at the door, $12 online or $10 through the local church (ask at your home church), or invite your friends to the Facebook page. Those wanting to pray for the Voices Together gathering in advance can meet June 28, 6:30 pm, at Glad Tidings Church on Fraser Street for a Prayer Rally. 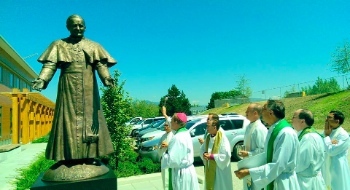 A statue of Pope John Paul II was unveiled on Tuesday outside the headquarters of Roman Catholic Archdiocese of Vancouver. Photo from their Facebook page. The Roman Catholic headquarters just west of Cambie on 33rd Avenue features a brand new more-than-life-size statue of Pope John Paul II. Unveiled June 23, it stands between the parking lot and entrance, facing the comfortable new quarters. The statue of Saint John Paul II (he has been made a saint since his death) was unveiled and blessed by Archbishop Michael Miller. Sculptor Louise Solecki Weir was on hand for the event. After nearly 60 years in the downtown core, the Archdiocese of Vancouver moved its administrative offices to the new John Paul II Pastoral Centre at 33rd and Willow area this spring. It is located on the newly-named Saint John Paul II Way. Hundreds of neighbours joined New Beginnings Baptist Church for their Praise in the Park gathering June 14. New Beginnings Baptist Church hosts Praise in the Park events a couple of times each year. The inner city church – located just south of Hastings Street and east of Clark Drive – sets up just across the street from its front door, in Woodland Park. 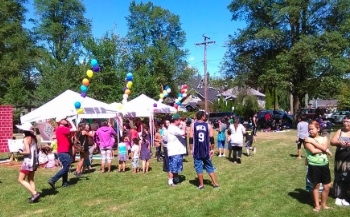 Teams from Northwest Langley Baptist, SouthRidge, Westwind Pentecostal, Ward Memorial Baptist, Mountainview Fellowship and West Coast Christian Fellowship joined New Beginnings for the afternoon, supplying and running the carnival, as well as serving food. There will be another Praise in the Park September 13. Russell says they will be adding horses, ponies and pony carts for that one.